Today was Day #4 of Chocolate and Holiday Spice Theme Week; and it seemed like a perfect time to brighten up a cold, holiday morning with an Oatmeal Cookie chocolate bar, from bean-to-bar maker Patric Chocolate (Columbia, MO). 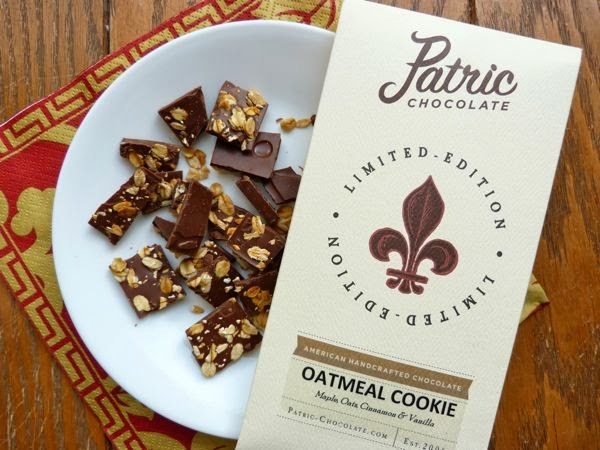 This Patric bar was made of sugar and spice and everything nice, including: organic maple sugar, oats, cinnamon, and vanilla. 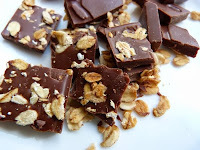 These ingredients were skillfully blended into (and laid on top of) a chocolate bar base, and yielded very tasty results. I preferred this Oatmeal Cookie bar over an actual oatmeal chocolate chip cookie; but then again the foundation for this "cookie" was a well-crafted, rich and flavorful chocolate that came from one of the best New American chocolate makers in the Show-Me State,* if not the U.S.
*The Show-Me State is an historic, informal name for the State of Missouri.